THIS IS A SPECIAL GATHERING CELEBRATING OUR 10TH YEAR ANNIVERSARY, AND DEDICATING THIS GATHERING TO THE VICTIMS OF THE MASSIVE EARTHQUAKE THAT STRUCK ON APRIL 25TH LEFT MANY WITH OUT A HOME, DESTROYED ENTIRE VILLAGES AND AFTERSHOCKS ARE TRAUMATIZING THEIR LIVELIHOOD. I AM COLLECTING $10.00 AND DONATING 50% DIRECTLY TO THE GROUND CREW HOW ARE WORKING DIRECTLY WITH THE VICTIMS BY PASSING ALL THE GOVERNMENT PROCEDURES, RED TAPE THAT ARE DELAYED THE AIDE TO THE VICTIMS. I THANK YOU IN ADVANCE FOR YOUR LOVE AND SUPPORT FOR THE PEOPLE OF NEPAL. THE DESTRUCTION IS SO MASSIVE, THEY ARE GOING TO NEED OUR HELP FOR A LONG TIME TO COME. THANK YOU ON BEHALF OF NEPAL AND IT’S PEOPLE! AND WE OFFER EVERYTHING 15% to 50% OFF! ALSO WE WOULD APPRECIATE IF YOU COULD BRING YOUR USED T-SHIRTS SO WE CAN MAKE INTO A SHOPPING BAGS TO ELIMINATE PLASTICS AND PAPERS BAGS INTO THE LAND FILEDS. Wizard Card Tarot Reading with Jason D McKean, the OMdogJason D McKean (aka OMdog) comes from a family of psychics and ministers, and hasbeen in touch with his inner-wizard in the creation of music, art, and the readingof tarot. His Wizard Card readings are insightful and grounded, offering clearsignposts on the path of life. He has produced bestselling OM chant albums that arelistened to world-wide in meditation centers, yoga studios, and places of healing and massage. Beautiful Eva Baboun – will have her magical table set up for anyone who needs a little healing massage!!! We have Gary Palmer my favorite artists with his ARTWORK how exciting. Boris Vagner a lyricist and manager. I co created the band and its seed of love! The band members are : Salome Gasviani- lead singer Richard Vagner – violist Theron Lynott – drummer, percussionist Trevor George- Bass Ryan Bratton – lead guitarfolk rock band called we the ones that vibrates the oneness within us all. We are all about spreading love peace and awareness. Using the vehicle of music to bring communities together! 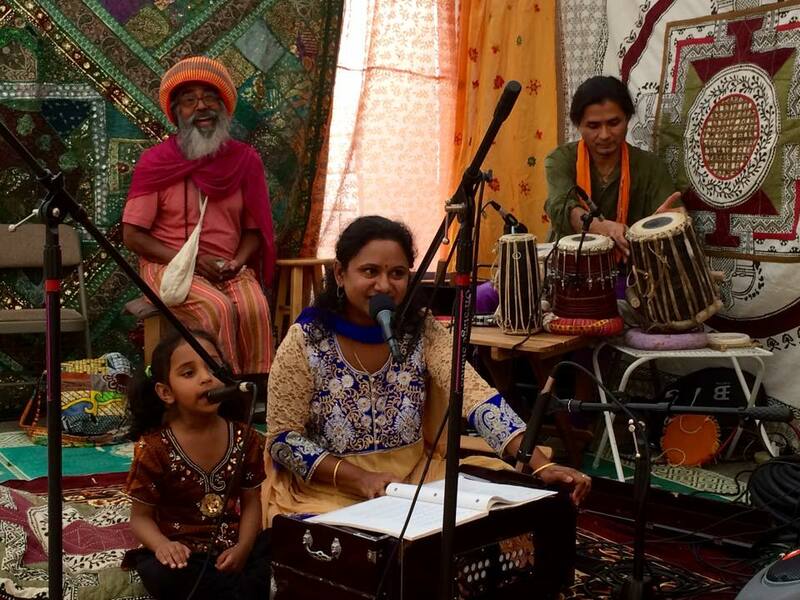 Kamini Natarajan is a Hindustani Classical Vocalist with specialized training in “Khayal” Gayaki. Kamini started learning music from age 3 and won several National Level awards like “Sur Shree” and “Sur Ratan”. She graduated in Vocal Hindustani music from Khairagarh University, India and Topped the University. Kamini is a graded artist from All India Radio (National Radio Station of India) and Doordarshan( National TV channel of India). More info on http://www.kaminimusic.com/music accompanied by Rajib Karmakar very talented Classical Sitar Player & on Tabala very talented Saheb Singh. The performances of KNOWLEDGE FREE feature extended musical improvisation (“jams”) over explosive rhythmic grooves and chord patterns, and long sets of music that can often cross genre and multi-cultural boundaries. Danni El and Jessica Tahereh are two female singer songwriter’s with Latin roots and a shared musical vision, who have come together and created a project they call La Caravana. Meant to be a band experience that is conducive of evolution, La Caravana incorporates different and changing musical elements. La Caravana, meaning “the caravan” invites a variety of sounds and vibrations, including different guest musicians to showcase their talents and share in their songs inspired by love, life, spiritual evolution, and the healing powers that be. La Caravana is meant to be an experience of unity, and encourages everyone to join the magical journey of love and adventure!